So, as you may recall, I let you in on the knowledge that we were planning to try a scaled down version of an office/closet makeover. Despite Jack getting sick, we have made a lot of progress. I was going to wait until it was completely finished to do a big reveal, but let's be honest...I wanted your input. So...make sure you read to the questions at the bottom to help a girl out! 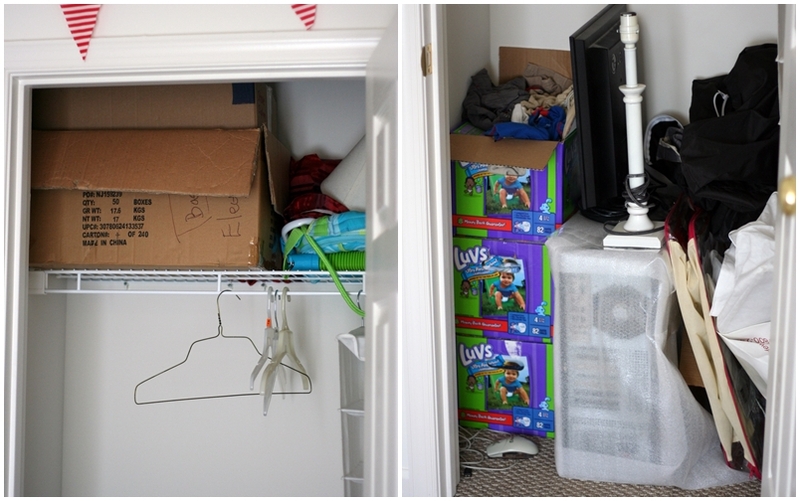 ...like I said, a small closet, but it wasn't being used for anything that couldn't be relegated to the basement. Saturday we hit up Lowes to pick up a few supplies. Jack found this to be a fun time, and held this little stick/board thingie for the whole trip. Could Daddy have had a cuter assistant? I think not. After a few more stops to pick out paint and fabric, we headed home to get to work. Matt took over all the measuring and cutting because, well, I can admit that those areas are NOT where my strengths lie. Jack was completely enthralled by all of Daddy's hard work, and insisted on being in the thick of the action anytime Matt was in the playroom. After we had the 'desk' part of the room set up, it was pretty much just figuring out where I wanted to go from there. I had bought a yard and a half of a fun print that I really loved, and wanted to make an impact without wallpaper or paint (landlords frown on those type things 'round here), so I pinned it on the wall. I told you I was working with thumb tacks! You thought I was kidding didn't you? I wish I was able to get a full picture of the closet, but seriously, the playroom is NOT large, I can't even get far enough away to fit it all in my viewfinder. Ah well. I scrounged around the house and pulled together unused items that I thought would look good in there, and be somewhat functional. 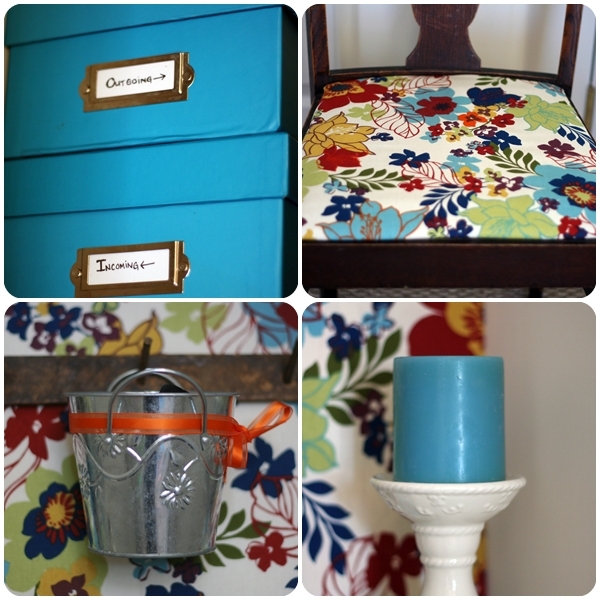 The coat hanger with the tins might be one of my favorite parts of this little makeover! The tins lined the aisle at our wedding, and I found the coat hanger. As in...stumbled on to it, and picked it up. For free. The blue incoming/outgoing boxes were the color inspiration for the room, we have issues organizing our mail, and this is so far what we have found to work for us. So, now, on to where I would like your help. Do you see the random lampstand in the room above? Well, I originally thought I would pick up a cute little shade for it, but now I am thinking not? Maybe I will get those weird little touch lights for the wall to save some space? So my friends, your input is welcome, I happen to know there are some of you out there with AMAZING houses, and would love your help. Unless you hate it...then just...you know...shush. 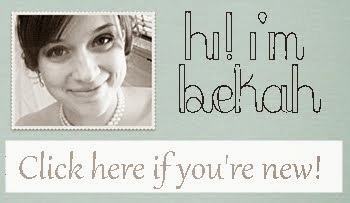 Bekah,,,I love it! Love the fabric...especially matching the chair. I would probably not do the stipes on the desk but either way on that. They used to make light bulbs that had pretty design on them...some of them were really funky and cute..some like stain glass...haven't seen them lately but if you could find them that might be the ticket for the light..I like it without a shade. I love it!! It looks so great. I would nix the lamp and do a wall mounted one to save space. Maybe put a small frame with a photo of something inspirational on the desk. What a neat idea! I love it!!! I would nix the lamp--that's a pretty small space, and you might end up needing the tabletop space for other things. Is there a light in the ceiling of the closet? If so, I'd swap it out with a pendant light. And I'd skip the stripes. I'd paint that desk RED, RED, RED!!! I *love* the fabric. I think it should be the star of the show and that you should keep the desk white. WOW! I'm impressed ... and quite inspired!! I never thought of doing that and I love it! Thanks Oukie! It runs deep in this family! LIKE YOU! Very very cute! I think it looks fab. I would probably forgo the lamp, unless you can find a really small narrow shade. pshaw! Are you not aware that a project is never to be completed??? only srated w good intentions....Oh that is me. hmmm well i like your closet. What a GREAT idea! It looks fantastic!! Also, and I don't do this often, but I "awww"ed out loud when I saw the toy drill. Oh, I LOVE LOVE IT!!!!! IT LOOKS STRAIGHT OUT OF REAL SIMPLE MAGAZINE!!!!!! Love that print choice too. Great transformation! The fabric is fabulous and adds a punch of color and pattern to the space. Thanks for linking up to the Workspace Showcase at WWC!